Where Susannah and Henry were held. In Britain during the eighteenth century methods of dealing with criminal behaviour, especially by the poor, were usually harsh to the point of brutality. It’s refreshing to be able to tell a different kind of story; one in which compassion, kindness and commonsense triumphed over all the odds to allow two young people to make a fresh start, albeit on the other side of the world. The story of Susannah Holmes and Henry Cabell or Kabel is far better known in Australia than it is in Britain today. Thus it will bear re-telling here, especially since it begins in Norwich Castle. To do justice to all the twists and turns, I will split it into three parts. In an earlier posting I wrote about the Georgian obsession with the death penalty and the belief that criminals were more often born than made. Nevertheless, only a fraction of those sentenced to death were executed. Far more had their sentences commuted to various periods of transportation to a penal colony. America had long been the chosen recipient of Britain’s unwanted ‘criminal classes’. However, the founders of the United States, traitors and rebels in British eyes, had no place for Britain’s criminals. Transportation came to a halt when the War of Independence started in 1776. For a while, some in the British government still hoped the American colonists might be persuaded (or compelled) to renew allegiance to the British Crown. The Peace of Paris in 1783, by which the thirteen American colonies finally won their independence from Britain, ended that hope. In the interim, felons were still sentenced to transportation to America, then held in British gaols until the sentence might be carried out. Finally, in December 1785 the Principal Secretary of State [Home Secretary in modern parlance], Thomas Townsend, Viscount Sydney, adopted the recommendation of Captain Cook to establish a Penal Colony in New South Wales. Arthur Phillip was commissioned to establish the settlement at Botany Bay. A fleet of convict ‘settlers’ was quickly organised. The lack of forethought given to it was breath-taking. The convicts selected were overwhelming urban, mostly from London. Few had even the most basic knowledge of farming or producing food, though it would be impossible to supply the colony from Britain, or anywhere else in the empire,. They would have to survive or die trying. At the last moment, someone also grasped a simple fact: an all-male group would never survive or establish a colony. Aside from any considerations of creating new colonists, in a world of strict division between men’s and women’s work, women were essential to cook, clean, sew and undertake all other domestic chores. An urgent call therefore went out to prisons all around Southern England to supply suitable female felons for immediate transportation to Botany Bay. One of the women selected was Susannah Holmes, then aged 22. She was being held in the Norfolk county gaol at Norwich Castle awaiting transportation for theft. Susannah Holmes came from Surlingham in the Norfolk Broads, about 6½ miles (10½ km) south-east of Norwich on the south bank of the River Yare between Bramerton and Rockland St Mary. She was baptised in the parish church there on March 6th, 1764. Her trial was held at Thetford Assizes before Mr. Justice Nares. There she was found guilty and duly noted sentenced to death because of the number and value of the goods she had stolen (53s.). However, as was usual with female felons, the sentence was commuted to fourteen years transportation to America. This sentence could not, of course, be carried out, so she was sent to the gaol at Norwich to wait until the authorities found somewhere else to send members of the ‘criminal classes’ like her. There she met Henry Cabell. Henry Cabell  had been in Norwich gaol since being condemned to death in 1783, aged 17, then reprieved on the grounds of his age and sentenced to transportation to a penal colony instead. The Cabells seem to have been a criminal clan on a large scale. Henry, from Medham in Suffolk, had been convicted of housebreaking along with his father, Henry senior, his father’s friend, Abraham Carman, and another young man, named Abraham Jacob. Early in 1783, they had broken into the house of Mrs Abigail Hambling and stolen ‘several feather beds and divers other articles’. Last week some villains broke into the house of Mrs Hambling at Alburgh, near Harleston, in this county and during the absence of the family, who were in this city, stripped it of every movable, taking the hangings from the bedsteads, and even the meat out of the pickle casks; it is supposed they also regaled themselves with wine, having left several empty bottles behind them. The marks of the feet of horses being seen in the orchard by a neighbour, was what first lead to a discovery of the burglary. The trial judge, Baron Eyre, wrote the standard letter seeking the King’s mercy on behalf of all the younger men condemned to death, including Henry and fourteen others convicted at the Norfolk Lent Assizes in 1783. Henry’s father and Carman were not included. They were hanged outside Norwich gaol on Saturday, 5 April 1783. Young Henry’s death sentence had been commuted to seven years transportation, so he stayed in the prison at Norwich, since there was nowhere to transport him to. 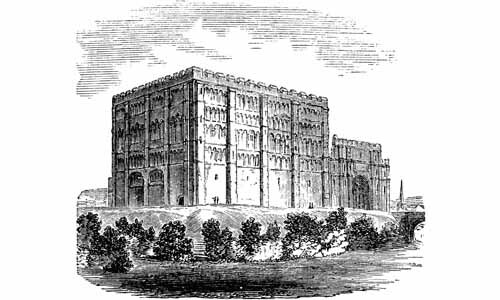 Henry and Susannah had been in Norwich Castle for three years. Since prisoners were allowed to mix and were not segregated by gender, it was hardly surprising that a good many relationships were formed. Most were casual. In the case of Henry and Susannah though, a child was born, Henry junior, and this seemed to have turned the relationship into something far deeper and more permanent. Norwich Castle gaol was a makeshift affair. The mediaeval castle had been converted to a gaol by building rough shelters for the inmates in the ruins of the keep. Similar shelters stood against the castle walls. According to the prison reformer John Howard, who visited the prison at about this time, the gaoler, George Glynne, was a humane man. Although prisoners were shackled some of the time, they were also allowed to mix. There was also a great deal of contact between the prisoners and the outside world, since prisoners relied on family and friends bringing them food or money to supplement their rations. They were supposed to get a basic food allowance, but in practice almost everything had to be bought or obtained by bribes. That was how the gaoler and turnkeys made their income, since they received no salary. Indeed, Glynne had to pay the Under-Sheriff £31.10s per year to retain his job. That’s around £3500.00 in today’s terms. The gaol was old, in poor repair and overcrowded. Food was in short supply. Some local residents took pity on the prisoners and sent in additional food. By 1786, the numbers of convicts built up there since transportation to America ended worried the citizens of Norwich. They petitioned the government to do something about it. It seemed the situation was becoming impossible inside the prison and out. It was in the midst of all this that Susannah gave birth to Henry’s child. On several occasions, the two asked for permission to marry. Each time, it was refused on the grounds that they were felons and therefore had lost all civil rights. On 5th November, 1786, therefore, a Norwich turnkey, John Simpson, arrived at the prison hulk “Dunkirk”, moored in the harbour at Plymouth, bringing three women selected as suitable from those under sentence of transportation now at Norwich gaol: Elisabeth Pulley, Susannah Holmes and Ann Turner. The party also contained Susannah Holmes’ baby son, conceived and born in the prison at Norwich on 17th February 1786. Susannah was chosen, so her baby had to go as well. Henry was not wanted by the authorities. He had to remain in Norwich, despite his frantic pleas to go with his woman and child. One of these unfortunate females was the mother of an infant about five months old, a very fine babe, whom she had suckled from its birth. The father of the child was likewise a felon under a similar sentence … he had repeatedly expressed a wish to be married to this woman, and though seldom permitted to see the child, he discovered a remarkable fondness for it, and that the mother’s only comfort was derived from its smiles, was evident from her peculiar manner of nursing it. It seemed nothing would shake the prison governor’s decision. …neither the entreaties of Mr. Simpson, nor the agonies of the poor wretch [Susannah], could prevail upon the captain even to permit the babe to remain till instructions could be received from the minister. Simpson was therefore obliged to take the child, and the frantic mother was led to her cell, execrating [cursing] the cruelty of the man under whose care she was now placed, and vowing to put an end to her life, as soon as she could obtain the means. Susannah had been separated from her man only days before, seemingly for good. Was she now to be separated for ever from her baby son too? I’ll explain what happened next in Part 2. This entry was posted in Crime, Georgian Society. Bookmark the permalink. Thanks for this. As so often in the 18th and 19th centuries, property and property rights ranked far higher than the lives of people, especially the poor.